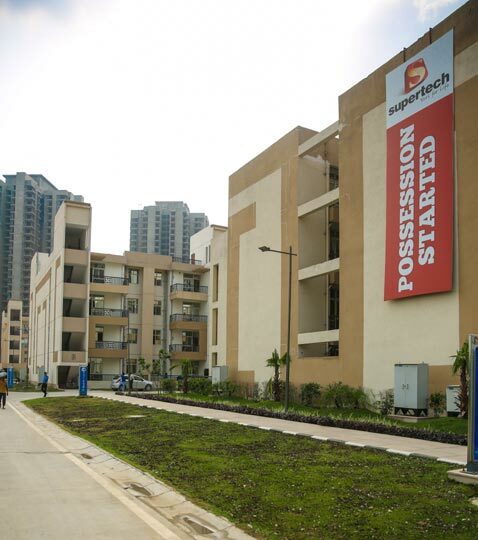 Just like its predecessors, Supertech Eco-Village III is yet another affordable residential complex with 2/3 BHK apartments (840sqft to 1850 sqft) in Greater Noida. Positioned as eco-friendly living, this three-sided open plot offers a combination of low and high-rise towers with 80% open landscaped area. The project comes with convenience stores, recreation features, including a bowling alley, clubhouse and sports facilities within the community. What intrigues us the most is the creative ROTI, KAPDA & EcoVillage. The product clearly defines its positioning with the ad and your expectations should be set as to what is on offer here. 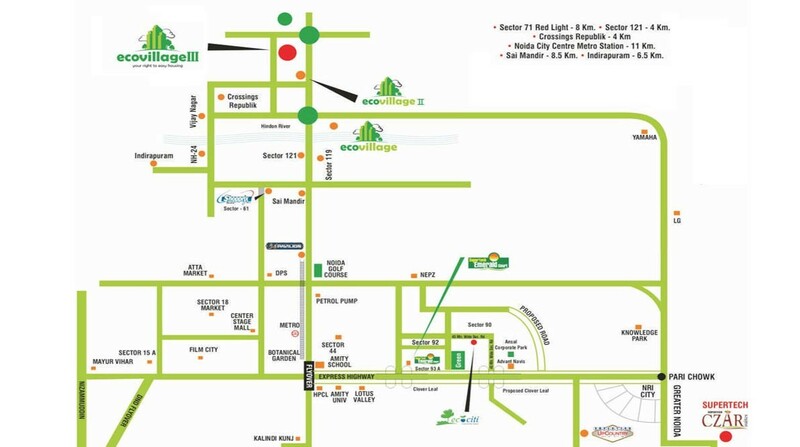 As you can see in the map Supertech Ecovillage 3 is located in sector 16 B, Greater Noida. Technically the location is good if you are looking for a long-term investment, but if you are looking at this for end use there are multiple issues. The IGI airport is 40 km away, Delhi Station 30 km away and the nearest metro station is 11 km away. So Delhi is some distance away at this moment. From Noida’s perspective, the developer is planning some retail within the vicinity and other developers like Gaur and Panchshil are in the vicinity. The location is well connected to basic amenities and facilities like a hospital (Fortis), shopping (Atta market) and schools. Supertech Ecovillage 3 consists of residential apartments units only with certain commercial set ups (Eco bazar) to provide basic amenities to the residents. 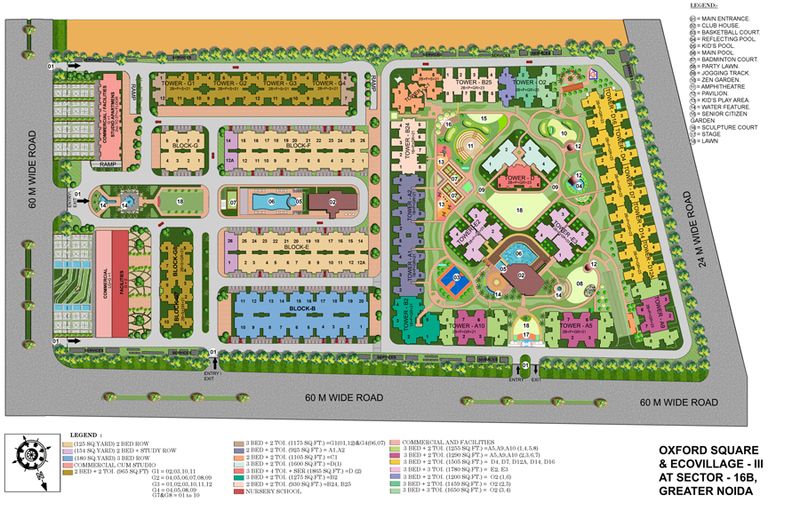 Altogether, over 2,700 units are planned in this project. A quick look at the plan and you know something is wrong. Supertech Ecovillage 3 which is spread over 11 acres is rectangular in shape. The plot is dense with multiple towers grouped in different zones. This, to be honest, looks like a Hyderabad project where a developer has tried to use maximum FSI. There are buildings everywhere on the periphery of this plot in the centre, virtually everywhere. If you want to still buy here be very careful of the apartment you choose. On the amenities bit Supertech Ecovillage 3 comes with typical amenities like clubhouses with swimming pool, gymnasium, tennis courts and many other facilities like gardens and open spaces. 2BHK : The 2 BHK’s come in 2 variants and there is something wrong with them at the outset if you are an end user. The bedroom sizes are small. The highlight is that the apartments come with decks attached ensuring the apartments get good ventilation and sunlight throughout the apartment. If you choose the apartment well you will get good views of the garden too. 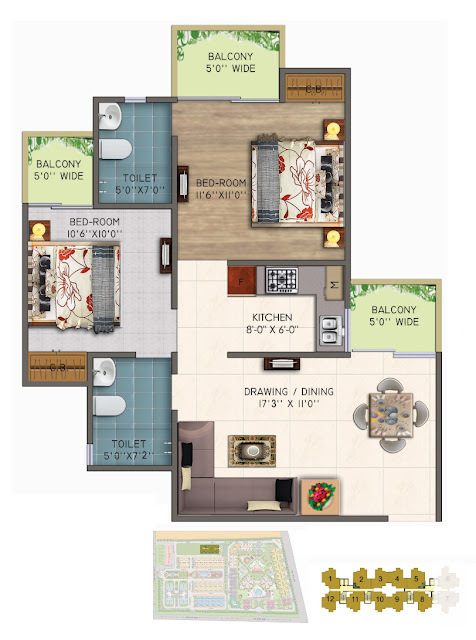 3BHK : At the outset we would like to mention the 3 BHK apartments of size 1850 sqft. are very well laid out. 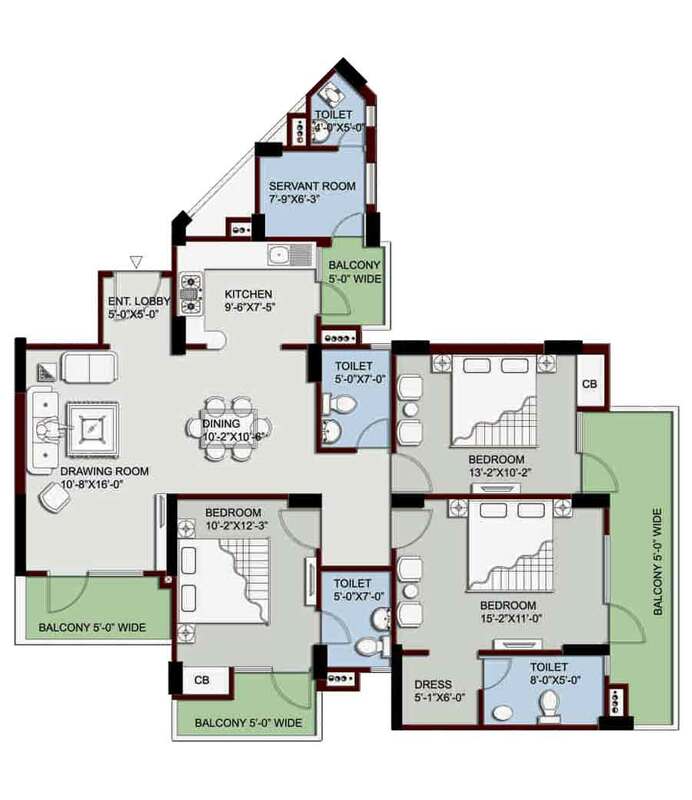 The design ensures privacy and maximum utility of space. The entrance foyer leads you into the living space which has an attached deck area. The highlight of the apartment is that there are decks attached to all the rooms. The bedrooms are spacious and the master bed comes with a dresser. A separate servant’s room is the icing on the cake (though a separate entrance would have been preferred). The apartment is finished with vitrified flooring. 1. Amenities like clubhouses with swimming pool, gym, bowling alley, tennis courts. What worries me here are the number of complaints I have read on various forums of court cases against the developer and cancellation issues. At this moment, we would like to say that these are investment homes, and there are Greater Noida has many alternate options which you would like to consider before calling this EcoVillage your home.